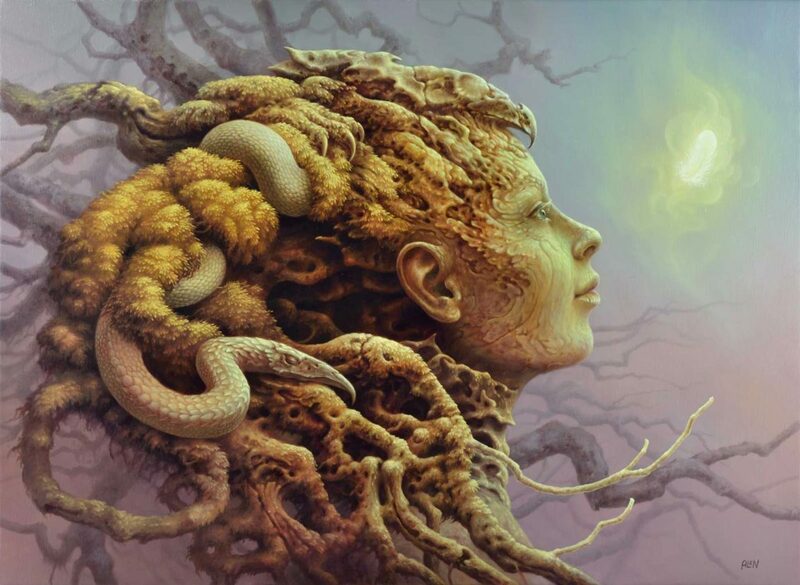 The new, astonishing creation by Tomasz Alen Kopera (G16 untitled, oil on canvas 76 x 56cm; 30 x 22in) is now presented at the exhibition “Im’ago Primordialis” at Krab Jab Studio, Seattle USA. The exhibition is open from July 9th til September 3rd 2016. Featuring Visionary artists from around the globe. Curated by artist Don Farrell. Includes work by Brigid Marlin, Peter Gric, Roku Sasaki, Tomasz Alen Kopera, Steven Kenny, Liba W. Stambollion, Igor Grechanyk, Amanda Sage, Miguel Tio, Autumn Skye Morrison, Susannah Martin, Andrew Gonzalez, Otto Rapp, Forest Rogers, Jean Pronovost, Benjamin Vierling, Jeff Mihalyo, Don Farrell, Yvette Endrijautzki, William Fahey, Bryan K. Ward and Martina Hoffmann. Additional works by HR Giger, Ernst Fuchs and Robert Venosa. Nowe dzieło Tomasza Alena Kopery (G16 bez tytułu, olej na płótnie, 76 x 56cm; 30 x 22in) jest prezentowany podczas wystawy “Im’ago Primordialis” w galerii Krab Jab Studio, Seattle USA. Wystawa jest otwarta od 9 lipca do 3 września 2016r. Na wystawie można zobaczyć dzieła wybitnych artystów z całego świata, między innymi: Brigid Marlin, Peter Gric, Roku Sasaki, Tomasz Alen Kopera, Steven Kenny, Liba W. Stambollion, Igor Grechanyk, Amanda Sage, Miguel Tio, Autumn Skye Morrison, Susannah Martin, Andrew Gonzalez, Otto Rapp, Forest Rogers, Jean Pronovost, Benjamin Vierling, Jeff Mihalyo, Don Farrell, Yvette Endrijautzki, William Fahey, Bryan K. Ward and Martina Hoffmann. Dodatkowo znajdą się tu prace HR Giger, Ernst Fuchs i Robert Venosa.